Tickets are on sale for Pensacola State College’s 2018 Holiday Experience. Presented by Michael and Jo Ann Price, the fourth annual Holiday Experience set for Thursday, Dec. 6, offers a glimpse of the College’s state-of-the-art Warrington campus. The interactive evening begins at 5:30 p.m. with hands-on tours of the Mary Ekdahl Smart Simulation Center and Department of Nursing and Emergency Medical Services facilities followed by stops at the Veterinary Technology Program and the Dental Clinic. Tickets are $75 each, and can be purchased at https://foundation.pensacolastate.edu/the-holiday-experience-december-6-2018/ . Throughout the evening, guests will be treated to tapas, holiday beverages and sweet treats. Entertainment is provided by the College’s Performing Arts Students and adds cheer to each stop. In the Mary Ekdahl Smart Simulation Center, guests will have the opportunity to hear heart tones and converse with patient simulators and meet Victoria, the College’s maternal and neonatal birthing simulator. Guests can also take a seat in the “stationary” ambulance and try to master the Virtual IV Station used by students. In the Veterinary Technology Program complex, guests can participate in a pet examination, read an X-ray and learn what canine and feline behaviors mean. Attendees are encouraged to bring towels, bedding, grooming products or toys to share with a fur baby in need. At the Dental Clinic, Pensacola State students will perform dental exams, and guests can assist by using an oversized dental simulator while instructors and students answer questions. At 7:15 p.m., a live auction, silent auction and Christmas tree auction of jewelry, artwork, and entertainment and vacation packages will be held in the Harrison Student Center, Building 3600. Attendees will enjoy mingling while enjoying assorted desserts, coffees and holiday cocktails. Proceeds from the auction will benefit students by supporting scholarships and programs. 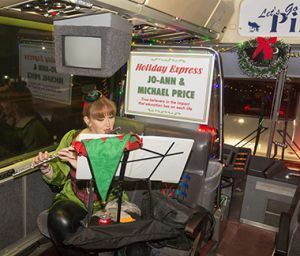 At 9 p.m., the PSC polar express will transport guests to their vehicles. Dress is casually festive for the 2018 Holiday Experience. For information on sponsorships, visit https://foundation.pensacolastate.edu/the-holiday-experience-december-6-2018/ .